Bacterial meningitis is one of the most dangerous infections in children. Meningitis can be swift and deadly. It can also lead to chronic disability. The fear of meningitis often haunts parents. Thankfully, most cases of bacterial meningitis can now be prevented. Meningitis is primarily an inflammation of the lining of the brain and spinal cord, and sometimes of the brain itself. Encephalitis is an inflammation primarily of the brain. Most of the time, the inflammation is caused by viral infections. Most of these are usually not very serious, except in very young babies. Rarely, the inflammation is caused by fungal or parasitic infections. Sometimes, though, meningitis is caused by a bacterial infection. Bacterial meningitis is the serious illness that people dread. Together, three types of bacteria account for over 90 percent of bacterial meningitis: H. influenza type b, meningococcus, and pneumococcus. These bacteria are transmitted by person-to-person contact through respiratory secretions. Many people carry these bacteria with no serious consequence (pneumococcus, for instance, is the most common cause of ear infections) but a few get very sick (pneumococcus causes meningitis in about 3 per 100,000 people). 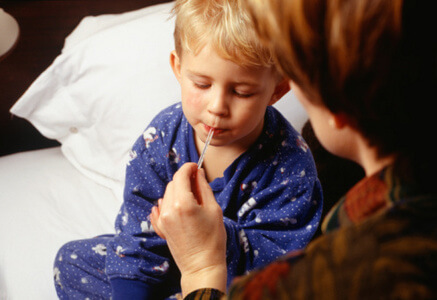 In children under 2 months old, Group B strep is a common cause of bacterial meningitis. Bacterial meningitis can occur at any age, but 95 percent of cases are in children under 5 years old. Boys are more likely to get it than girls. Bacterial meningitis strikes in two common ways. Sudden onset meningitis features shock, internal bleeding, purple spots, and reduced consciousness at the very outset, with a rapidly progressive course often resulting in death within 24 hours. More commonly, meningitis begins with several days of upper respiratory symptoms or gastrointestinal symptoms. It often begins with an ear infection. Most children develop high fevers, severe headaches, and poor feeding. They may also have muscle aches, nasal congestion, vomiting, neck stiffness, and seizures. Children with meningitis become increasingly irritable and/or lethargic. The presence of petechiae and purpura (purple spots that indicate internal bleeding) is a sign that the infection may be raging out of control. Meningitis can be quite contagious, depending on the organism causing the infection. Alert your pediatrician immediately if you think your child may have been exposed. A preventive medicine such as rifampin may be important for close contacts. For most of human history, the great majority of children with bacterial meningitis died within days. Those who survived usually had an ongoing disability, such as deafness, developmental delay, and/or seizures. With antibiotics, the great majority of children with bacterial meningitis survive, usually without long-term complications. Treatment usually takes one to three weeks. Bacterial meningitis may be suspected based on the history, physical exam, and initial blood tests, but the diagnosis is made by a procedure called a lumbar puncture, or spinal tap. Here a small needle is placed in the fluid-filled space in the small of the back, just below the spinal cord. This fluid is tested for the presence of inflammation and for organisms. Bacterial meningitis is managed aggressively. The core treatment is intravenous antibiotics. IV fluids and other medications may be needed to reduce inflammation and prevent or treat any complications. Breastfeeding is somewhat protective against meningitis. Vaccines and preventive antibiotics when exposed are two powerful methods of prevention. When I was in my pediatrics training H. influenzae Type b (HIB) far surpassed all other causes of bacterial meningitis. In 1991, a vaccine against these bacteria was incorporated into the routine immunization schedule beginning at 2 months of age. The incidence of meningitis plummeted. Within a few years, the number of cases dropped by 95 percent in the United States as a whole, and has continued to fall. Now a vaccine to pneumococcal bacteria is also a part of the routine schedule. In large clinical studies, the vaccine has been shown to decrease the risk of pneumococcal meningitis by more than 90 percent. Two different meningococcal vaccines are also available, but are not routinely recommended for very young children. It is recommended, though, beginning in 2008, for all children over 11 years of age to receive a meningococcal vaccine, especially before heading off to live in any dorms or barracks. The other meningococcal vaccine is useful in young children or adults living in endemic areas, who don’t have a working spleen, or who have one of several other forms of immune deficiencies. Whatever preventive measures you have taken, if you suspect that your child may have been exposed to meningitis, talk with your doctor about the possibility of preventive antibiotics.